Promising four-year-old English Gambler has pleased trainer Lauren Brennan in his four career starts to date and she believes he has the potential to reach cups class in New Zealand. The gelding has yet to finish outside the top two and broke through for his maiden victory over a mile at Tauranga last month. He is unbeaten at the distance and will attempt to keep that record intact when he lines-up in the Auckland Co-op Taxis 1600 at Te Aroha on Sunday. 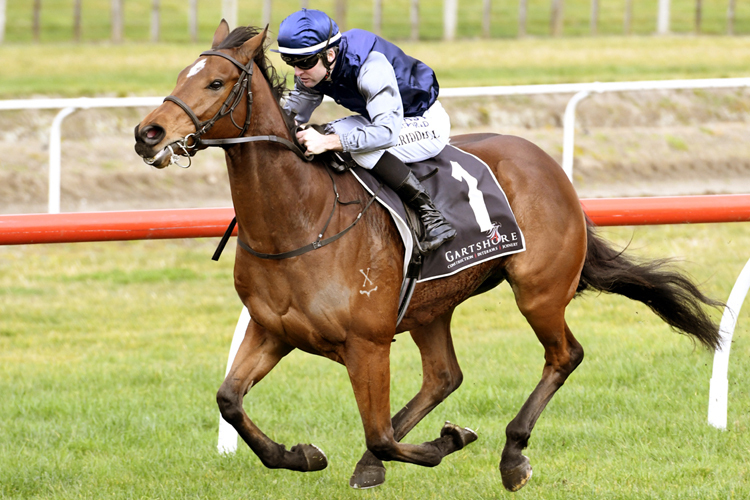 English Gambler dropped back in distance for his last-start runner-up performance in the $101,000 Platinum Homes Taranaki Challenge (1400m) at New Plymouth and Brennan thinks he will appreciate the step back up to a mile. “He’s really kicked-off well,” Brennan said. “He’s drawn nicely (barrier 4) and once he matures he might be a nice cups horse. English Gambler is owned in Singapore but the gelding is set to continue his racing career in New Zealand, with Brennan believing he will develop into a quality stayer in time. “It will possibly be his last race (this campaign) with the heavy track. So we’ll see how the weather plays out, hopefully the track will come back a little bit.